PATIENT FROM CHCHATTISGARH is being treated by AYURVEDA and AYUSH THEREPIES combination remedies at our research center before five months for manu complaints he have including high level of SERUM CREATININE and is still under our treatment. His pathological findings and examination results are given below. Before treatment his creatinine level was reached upto 2.9 mg/dl, after above report. But combination treatment of his complaints, which he have and should not be disclosed by us as our patient secrets should not be given to others, which is our policy, we are unable to say more about this patient. All physicians should keep secracy of patient complaints and should not be share by others, this is our commitment. After Five months of AYURVEDIC and HOMOEOPATHIC and UNANI and dietary management and life style according to Ayurveda is suggested to this patient. The results are before you. In fact ETG AyurvedaScan Data bases examination results provides four dimensional diagnosis and disease picture of patient. This is an actually combination of Modern medicine Diagnosis based on the pathophysiological and pathology and AYURVEDA BASIC PRINCIPLES and Homoeopathy basic principles and Unani Basic principles and Nature-cure principles. When these all is combined into one , the patient complaints and disease diagnosis precipitates and what is wrong with the patient and what should be treated in patient that is cropped up. 3- Complaints for which patient came for treatment to Doctor / Physician. This we study for trying to find the all four problem’s conclusions and for that to purpose of treatment we select the AYUSH remedies in combination for treatment purposes. We produce here cure of LEUCODERMA disorders with evidence and proof , collected from patient’s treatment after examination by ETG AyurvedaScan and its allied tests and by AYURVEDA and AYUSH therapies treatment and management. 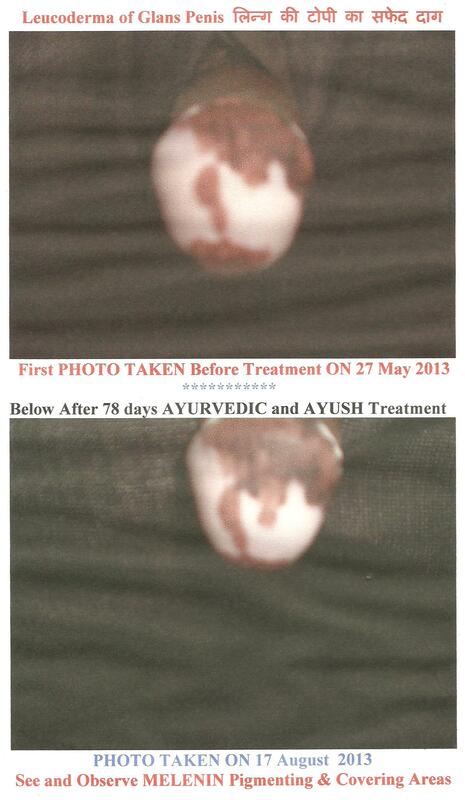 Below given photographs of a 14 years old patient came for LEUCODERMA treatment before 90 days. Although his parents told me that the boy was not very regular for in- taking of Ayurveda and Ayush remedies prescribed for him. His first Photograph was taken before 90 days. See and observe the photograph. After 90 days of the AYURVDA and AYUSH treatment and management changes and almost total cure have been seen as is seen in below photo, taken after 91st day. Almost 100 percent LEUCODERMA cases responses for CURE by AYURVEDA and AYUSH therapies combination treatment after examining whole body by ETG AyurvedaScan and its supplementary tests bases on the line of Ayurveda. These evidences shows that if we claim for total cure of LEUCODERMA, our claim is in right direction. इस कमेन्ट्स से मुझे बहुत दुख पहुन्चा है !!!!! THIS COMMENT HURTS ME. The comments which I received today is in the comment box, which someone send it from ID no. 101.212.70.26. I do not know the motive of writing in this kind of language, what shows it ? However I excuses this person for this comments and again I humbly request this person very politely that I am not excepting his comments, what he is written in comment box ? You can lodge a complaint for IP address 101.212.70.26 Report Abuse. This IP address 101.212.70.26 is located in India, Bihar, Bansdih. ISP of this IP address is Aircel Kolakta Mobilebroadband Customer. The area code is 099. The postcode is 221314. The IDD code of this country (India) is 91. The current time is 08 Jun, 2016 08:32 PM (UTC +05:30). IP address 101.212.70.26 is located at India, Bihar, Bansdih. हस्त- मैथुन यानी मास्टर्बेशन यानी MASTURBATION / HAND PRACTICE ; यह किस तरह की तकलीफ या बीमारी है और इसका क्या और कैसे इलाज किया जा सकता है ? PATIENTS FROM OTHER COUNTRIES / NEIBOURING COUNTRIES / OUT SIDE INDIA / CONTINENT’S CITIZENS / OVERSEAS SICK PERSONS , who want our treatment for any disorders, should contact Dr. D.B. Bajpai by e-mail because telephonic contacts / telephonic talks / telephonic conversations are not possible for us.